Every Saturday we introduce you to a new or up-and-coming artist in Meet The Band. This week, we’re spotlighting the Indian death metal group Darkrypt, whose debut album Delirious Excursion was recently released. Vocalist/bassist Amey Bhole, guitarists Mihar Gaikwad and Rishabh Ravi and drummer Aumkar Lele introduce us to Darkrypt. Give us a brief history of Darkrypt. Darkrypt was formed in 2013 by Amey Bhole on bass/vocals and Nachiket Bhave on guitars. After being dormant for quite a while and struggling through to find musicians that could fit in, Aumkar Lele and Rishabh Ravi joined in on drums and guitars respectively to form the first stable lineup. And in early 2014 with Mihir Gaikwad on-board on guitars for live gigs, the band kept pushing ahead enough to start getting noticed. Aumkar Lele: We were initially working towards putting out an EP through Transcending Obscurity, but Kunal Choksi (founder of Transcending Obscurity) convinced us to write more material to make a full fledged album. Finally Nachiket quit the band in November 2015, due to some personal commitments and we asked Mihir to join in as a full time member forming the lineup that everyone recognizes already. Describe the songwriting and recording process for Delirious Excursion. Amey Bhole: We began writing songs in late 2013. By 2015, we had written about four songs which we wanted to put together as an EP. However, as plans changed, we scrapped what we had written and we decided to start from scratch. We made a storyline for about 9-10 songs making each song equally significant. We thus named each song and decided what it was about. Mihir Gaikwad: “Chasm of Death” was the first song we composed and it was released as a single almost two years back. Later, we finished composing the songs “Abstract Submission” and “Cryptic Illusions,” but we were not satisfied with them as they were not fitting well with the flow and the structure of the album. So we decide to scrap them and write them again from scratch. Due to this, we were running quite behind the schedule than we had originally planned. When we had written about 60 percent of the album, we decided to start recording the album that we had cemented together. 40 percent of the songs were written and formalized after our recording sessions had already started. This allowed us to understand better the flow of our album and allowed us to write more naturally to keep the songs cohesive. Technical aspects aside, the storyline was important because we didn’t want our music to be vague and meaningless. We had certain beliefs and thoughts that we truly wanted to put out. How did Rogga Johansson (Paganizer) and Nitin Rajan (Primitiv)’s guest appearances come about? Rishabh Ravi: Nitin Rajan has been a local metal legend and one of the most experienced folks out here. We witnessed Nitin crushing the stage live multiple times with Primitiv as well as his other bands, and we always wanted to have him onboard with us after listening to Primitiv’s mind-blowing new album. Thus, “The Inducer” was born.. featuring Nitin on vocals with our vocalist Amey and guitarist Rishabh on backing vocals. Nitin did a totally amazing and brutal job. 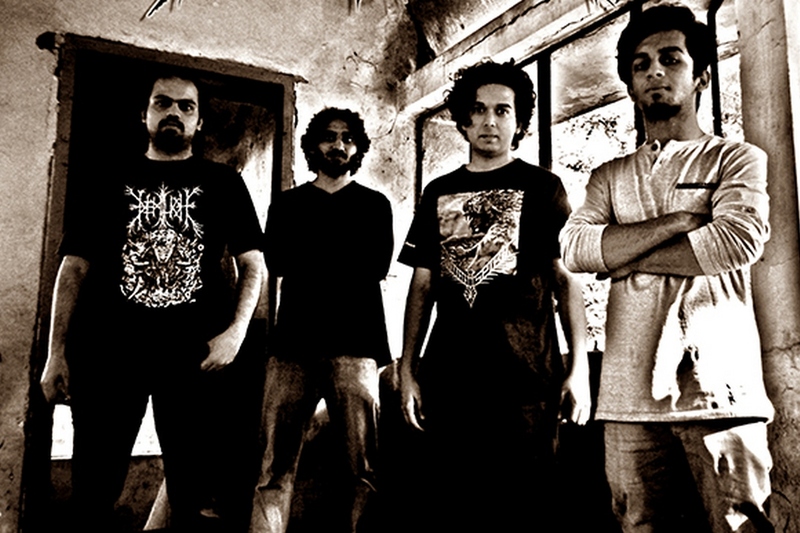 Aumkar: We play death metal, which is pretty evident to most of the listeners. But the uniqueness and essence of our album comes from that fact that our music is an amalgamation of various styles and influences that we’ve accumulated over the years since we started learning music. Lots of riffs have been influenced by Scandinavian death metal while the guitar solos have lots of neoclassical influences but you can also find some contemporary jazz inspiration. Mihir: The lyrics of Delirious Excursion revolve around a psychopath’s personal and psychological journey. We don’t explain any backstory as a plot-device. Our story revolves around this journey of a psychopath as his hate transforms him into a murderer. Each song is a like an event in his personal story and speaks of his transformation. Hate and violence are pretty common aspects of our society. But also equally important is the guilt, the sadness; those realizations that any self-conscious human feels deep within after committing violence. We don’t justify violence or hate. But it’s an important part of human nature that we’ve all a lot to work on. We simply wrote about the whimsical savageness and brutality of human nature to ask ourselves if this madness is an evolutionary trait. And we tried to revolve around this man’s psychological transformation as closely as possible and to put the listener in his shoes. Mihir: We wished for our music to reach out to death metal fans or metal fans in general. We wanted to put out a solid piece of art. We believe it has a cultural value, a cultural contribution to the society of a sort. We’re pretty satisfied and happy with what we could achieve. What has been your most memorable Darkrypt live show? Amey: One of the most memorable show we played was Thunderstorm 2.0 (organized by our manager Sushant Yadav) in January 2016, in our home city Mumbai. It was the first show we played after announcing our album and we had a great crowd really pumped up by our announcement. Rishabh: As of now, we’re practicing hard to be a tighter band and to be better musicians overall. As such, we do not have any specific plans in the near future. But we’re definitely exploring some touring options to reach out to more audience. What’s the heavy music scene like in Mumbai? Rishabh: Heavy metal in Mumbai is limited in terms of audience. It’s pretty much a niche venture. We feel it’s been a bit stagnant for a while as very few bands want to invest themselves in writing original music. The scene is definitely developing though due to some outstanding efforts from local promoters like Kunal Choksi and Sahil Makhija. We hope it becomes huge. Rishabh: Jeff Loomis, Obscura, Autopsy, Revocation and Iron Maiden. Mihir: Terrorizer, Demigod, Revocation, Judas Priest, Manigance, Lonewolf. Mihir: We hope you enjoyed our music. We want to thank you for having us here and Kunal for giving us the opportunity we needed. We’d also like to thank our families and everyone else who has supported us this far in whatever ways they could. We truly appreciate it. Anyone interested in our music or T-shirt can purchase it via Bandcamp or Transcending Obscurity. You can buy merchandise here. Make sure to check out our Facebook page.